Don’t let your hard floors get stained, darker and filled with dirt. Use our effective and affordable services to ensure the impeccable state of the tiles, slates, grout and slabs. We offer top-quality hard floor cleaning and polishing services which can be used by holders of domestic and commercial estates in Battersea at reasonable rates. You can spend your free time in a better way than trying to wash and sanitise your hard floors. Our cleaners can restore the flawless state of your tiles, slates and other floor coverings. Our technicians use powerful machines that work with pads, squeegees or brushes which reach to all crevices, grout and surfaces. They remove stubborn stains, darkening, mould and limescale without a problem. Rely on our staff to provide effective washing and sanitising of your ceramic, vinyl, slate, natural stone and other kinds of floors. They test the detergents and cleaning solutions in advance and spread them over the floor with scrubbing and rotary machines. Use our hard floor cleaning and polishing services which we offer to the holders of residential, office and commercial estates in Battersea, SW11. Our staff will scrub and sanitise the floors in the rooms to make them impeccable. 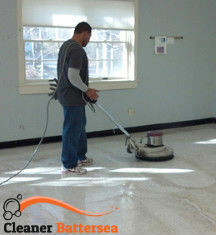 Our staff remove the old sealant from the floor after washing and dry mopping it. They use special buffers and polishing machines to make hard floors even, smooth, rid of scratches, old sealants and defects. 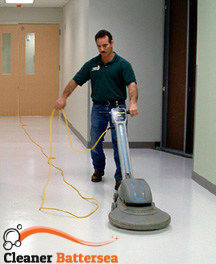 Our staff carry out effective hard floor cleaning and polishing which we offer in SW11 to proprietors and homeowners. The rotary machines and buffers function under high speed and remove all imperfections from the surfaces. Our workmen spread the new sealant evenly using advanced rotary machines designated for this purpose. They can make your hard floors more resistant to daily usage and have longer lifespan.